The buck moth, Hemileuca maia (Drury), is a member of Saturniidae, the giant silkworm family. This primarily tropical family also includes the luna moth, Actias luna (Linnaeus); imperial moth, Eacles imperialis (Drury); polyphemus moth, Antheraea polyphemus (Cramer), regal moth, Citheronia regalis (Fabricius); and io moth, Automeris io (Fabricius). Figure 1. Adult buck moth, Hemileuca maia (Drury). Photograph by Howell C. Curtis. Figure 2. 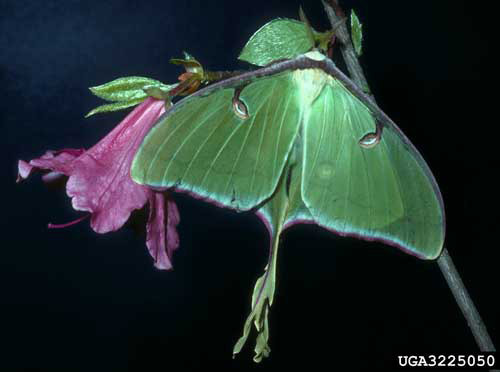 Adult luna moth, Actias luna (Linnaeus). Photograph by Ronald F. Billings, Texas Forest Service, Bugwood.org. Figure 3. Adult polyphemus moth, Antheraea polyphemus (Cramer). Photograph by Lacy L. Hyche, Auburn University, Bugwood.org. All of these species are found within Florida. 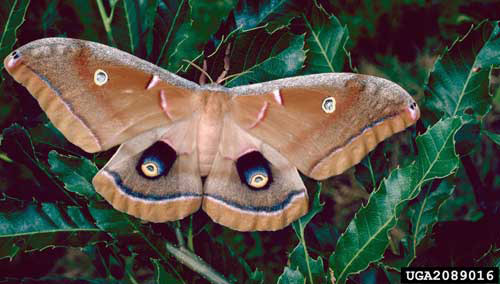 Moths of this family have a medium to large body size with a wide wingspan. 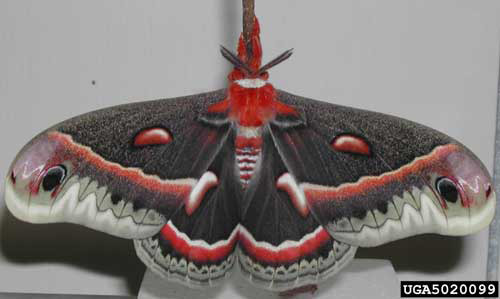 The cecropia moth, Hyalophora cecropia (Linnaeus), is the largest North American species of Saturniidae and has a wingspan up to six inches (15 cm). The adults in this family have mouthparts that are either very reduced or absent. They rely on resources that are acquired by the caterpillars (larvae). The caterpillars are robust and can exceed four inches (10 cm) in North America. Figure 4. Adult cecropia moth, Hyalophora cecropia (Linnaeus). Photograph by Pennsylvania Department of Conservation and Natural Resources - Forestry Archive, Bugwood.org. Figure 5. A caterpillar of the polyphemus moth, Antheraea polyphemus (Cramer), showing how large giant silkworm caterpillars can become. Photograph by David J. Moorhead, University of Georgia, Bugwood.org. The buck moth is in the subfamily Hemileucinae, the buck and day moths. The individuals within this subfamily are found only in the Western Hemisphere. The majority of the species occur in the Neotropics, the region of the Western Hemisphere that occurs south of the Tropic of Cancer and includes southern Mexico, Central and South America, and the West Indies (Scoble 1995). Caterpillars in this subfamily have numerous multi-branched spines on their bodies, which are used defensively, delivering a sting when touched (Wagner 2005). The range caterpillar, Hemileuca olivae Cockerell, occurs in Mexico and in parts of the U.S. states of Colorado, Kansas, New Mexico, Oklahoma and Texas. 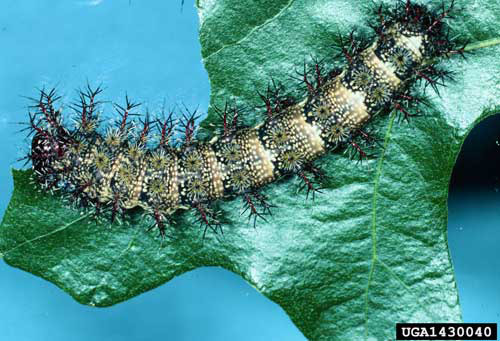 This caterpillar is found on grasses and can be problematic for livestock in infested pastures (Opler et al. 2009b). The adult females of a Neotropical genus, Hylesia, also possess urticating (stinging) hairs on their abdomen. 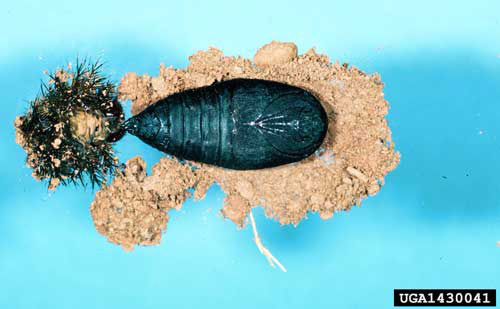 These hairs are used both as defense for the adult and to defend their eggs (Scoble 1995). The larvae of this genus possess stinging spines as well. The buck moth is found in the eastern United States from Maine to Florida. However, it has been found as far west as Wisconsin, Kansas, and Texas (Covell 1984). Figure 6. Confirmed reports of the buck moth. Illustration from Butterflies and Moths of North America (Opler et al. 2009a). 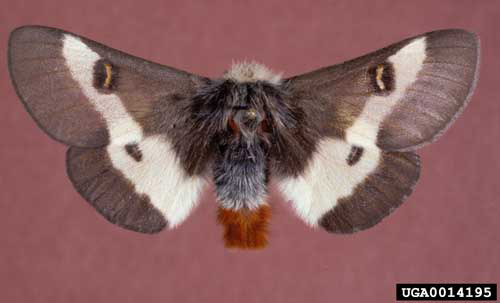 Adults: The adult buck moths have a wingspan that ranges from five to 7.5 cm (2-3 inches). Both their forewings and hindwings are mainly black with a narrow white band running through the center of the wing. Specimens collected in Florida have a reduction of the white band in the forewing more commonly than in other states (Ferguson 1971). 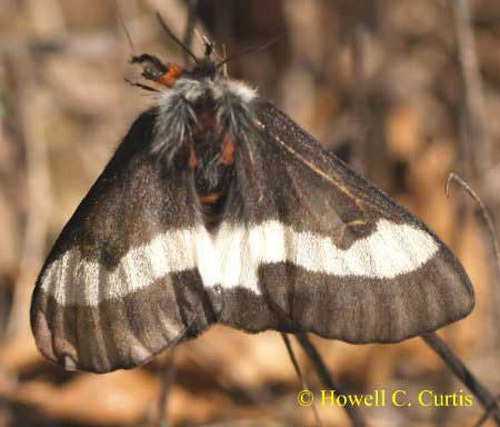 The forewing of the buck moth also contains a black-bordered reniform (kidney-shaped) spot that touches the outer edge of the black patch that is closest to the moth's body. A reniform spot is a type of spot that occurs on the outer part of the forewings of moths (Covell 1984). The hindwings of the buck moth have a black edged discal spot that occurs within the white band. All three segments of the female's body (head, thorax, and abdomen) are black. The body of the male is also black except for the tip of the abdomen, which is red. Also, the females generally have larger bodies and wingspans than the males. Figure 7. Adult male buck moth, Hemileuca maia (Drury). Photograph by Gerald J. Lenhard, Bugwood.org. Larvae: According to Wagner (2005), the background color of the buck moth larvae is generally black; however, it can be almost white. The thorax (first three segments behind the head) and abdomen (segments behind the thorax) are heavily covered with white spots. The spiracles (openings to the respiratory system) have a pale brown color and are edged with black. The spines that the larva uses to defend itself are multi-branched and occur in multiple rows on the body. The spines found in the rows on the top of the body are longer and have more branches. The larvae can reach a length of 6.5 cm (2.5 inches) when they are fully grown. Figure 8. The dark form of the buck moth larva, Hemileuca maia (Drury). Photograph by Susan Ellis, Bugwood.org. Figure 9. The light form of the buck moth larva, Hemileuca maia (Drury). This larva is almost fully-grown. Photograph by Lacy L. Hyche, Auburn University, Bugwood.org. Buck moth caterpillars that have a light background color can be confused with both the Nevada buck moth, Hemileuca nevadensis Stretch, and the New England buck moth, Hemileuca lucina Henry Edwards. The larvae of these three species can best be distinguished based on the preferred host plants (Wagner 2005). The caterpillars of the Nevada buck moth feed principally on willow, while those of the New England buck moth feed on meadowsweet, Spiraea spp. In addition, the spines of the buck moth are longer than those of the other two species (Ferguson 2005). A single generation of buck moths occurs each year. The adult buck moths have a flight period that occurs between October and November. However, there are records of them flying as early as September in Northern states and as late as December in Florida (Ferguson 1971). The adults are active during the day and are very quick fliers, and can be found flying most commonly between noon and 2:00 pm in oak forests during sunny weather (Covell 1984). After mating, the female oviposits in a ring around a branch of the host plant. The eggs overwinter on the host plant. The larvae hatch in the spring when new plant growth appears (Ferguson 1971). Figure 10. 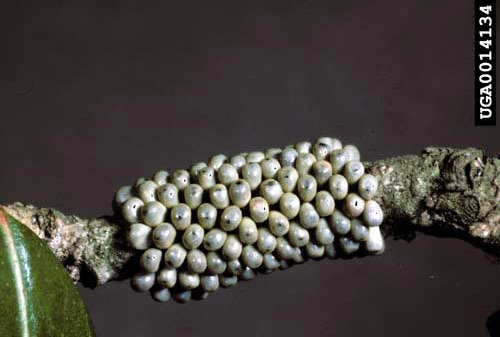 The eggs of the buck moth, Hemileuca maia (Drury), are laid in a ring around a twig of the host plant. Photograph by: Gerald J. Lenhard, Bugwood.org. Like other members of their subfamily, buck moth larvae are gregarious (group together) for their first three larval instars (Wagner 2005). 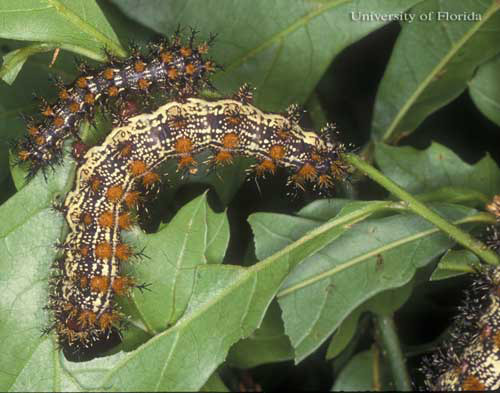 After the third instar, the larvae separate from each other and wander onto other plants where they feed until ready to pupate. The caterpillars pupate in debris that is either near to or on the ground, and if they spin a cocoon, it is not very large (Ferguson 1971). Buck moths may not emerge from their pupae for up to two years. Because the adults have no functional mouthparts they do not feed. Their main purpose is to mate and lay eggs. Figure 11. 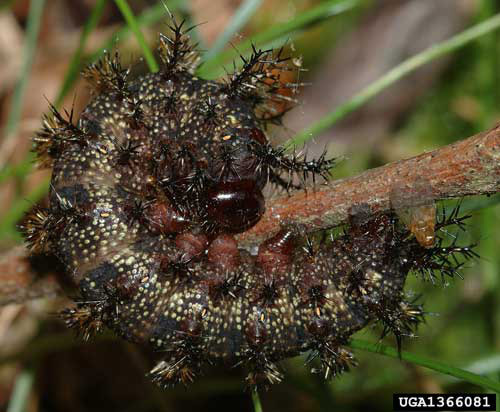 Larvae of the buck moth, Hemileuca maia (Drury), feeding gregariously. Photograph by James Castner, University of Florida. Figure 12. The shed, final instar skin (left) of the buck moth, Hemileuca maia (Drury), with the pupae (right). Photograph by Lacy L. Hyche, Auburn University, Bugwood.org. Figure 13. Adult buck moths, Hemileuca maia (Drury), mating. Photograph by Howell C. Curtis. 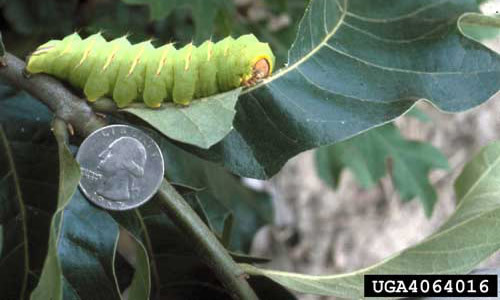 The larvae of the buck moth feed on oaks, Quercus spp., and when it is present they preferentially feed on the scrub oak, Quercus ilicifolia (Covell 1984, Wagner 2005). Smith (1974) successfully reared the larvae on willow, Salix spp. The larvae of this subfamily possess multi-branched urticating spines, which deliver a sting when touched. The severity of stings depends upon the species, and ranges from inducing immediate pain, severe itching, swelling, and redness (Diaz 2005), to causing death through hemorrhaging (when stung by caterpillars of the Neotropical genus Lonomia) (Carrijo-Carvalho and Chudzinski-Tavassi 2007). 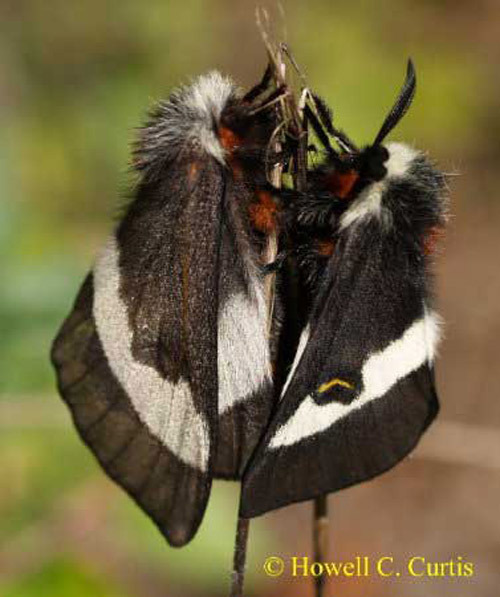 Death from contact with Lonomia caterpillars often results from multiple venom exposures due to their gregarious feeding behaviour (Diaz 2005). 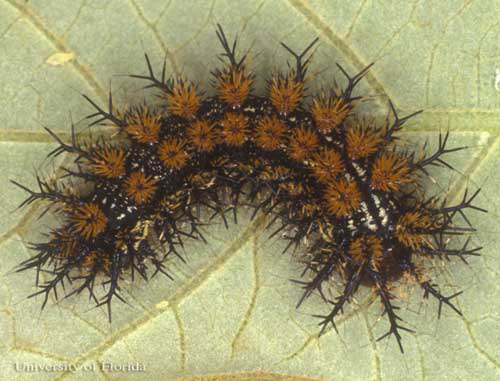 The caterpillar of the io moth, which occurs in Florida, also defends itself with urticating spines. The spines in the buck moth occur on raised, sclerotized (hardened) portions of the larva's cuticle that are known as tubercles and scoli. The spines found on these structures are associated with venom glands that occur within the caterpillar's body. According to Diaz (2005), the sting of the buck moth is similar to that of the saddleback caterpillar, Acharia stimulea (Clemens). The sting produces pain immediately, which then spreads to nearby lymphatic nodes. The caterpillar's sting then causes swelling and redness to occur. These symptoms can last for as little as a day to over a week. Wagner (2005) reported that the stings he received from a buck moth caterpillar were still present after ten days and the venom of the caterpillar caused a small hemorrhage where each spine had stung him. According to Diaz (2005), severe reactions to the venom of the buck moth (such as anaphylaxis) are rare. He recommends treating stings from these caterpillars by washing the site immediately in order to remove any loose spines that might be present. The site should be allowed to dry without the use of a towel. Any remaining spines should then be removed with an adhesive such as duct tape. Finally you can apply ice packs to the site to relieve some of the pain. Not handling caterpillars that have spines is one of the best ways to avoid receiving stings. Figure 14. Close up, dorsal view of the stinging spines of a buck moth, Hemileuca maia (Drury), larva. Photograph by James Castner, University of Florida. Carrijo-Carvalho LC, Chudzinski-Tavassi AM. 2007. The venom of the Lonomia caterpillar: An overview. Toxicon 49: 741-757. Covell CV. 1984. A Field Guide to Moths of Eastern North America. Special Publication Number 12. Virginia Museum of Natural History. Martinsville, Virginia. 496 pp. Diaz JH. 2005. The evolving global epidemiology, syndromic classification, management, and prevention of caterpillar envenoming. American Journal of Tropical Medicine and Hygiene 72: 347-357. Ferguson DC. 1972. In Dominick RB, Edwards CR, Ferguson DC, Franclemont JG, Hodges RW, Munroe EG. The Moths of America North of Mexico, fasc. 20.2A, Bombycoidea Saturniidae (in part). EW Classey, LTD. Middlesex, England. Opler PA, Lotts K, Naberhaus T. (2009a). Eastern buckmoth, Hemileuca maia (Drury, 1773). Butterflies and Moths of North America. http://www.butterfliesandmoths.org/species?l=3314 (16 September 2009). Opler PA, Lotts K, Naberhaus T. (2009b). Range caterpillar moth, Hemileuca oliviae T.D.A. Cockerell, 1898. Butterflies and Moths of North America. http://www.butterfliesandmoths.org/species?l=3325 (22 September 2009). Scoble MJ. 1995. The Lepidoptera Form, Function and Diversity. The Natural History Museum. Oxford University Press. New York, New York. 404 pp. Smith MJ. 1974. Life history notes on some Hemileuca species (Saturniidae). Journal of the Lepidopterists' Society 28: 142-145. Wagner DL. 2005. Caterpillars of Eastern North America: A Guide to Identification and Natural History. Princeton Field Guides. Princeton University Press. Princeton, New Jersey. 512 pp. Publication Date: September 2009. Latest Revision: October 2012. Reviewed: November 2018.